- What became of Harry, and does he have any living descendants? - Where did the 'Bentley' come from in our English ancestry? - Exactly when did James arrive in Australia and what ship did he come in? - Why have so few photos of James & Margaret found their way down to us? He sent a photo of himself and house back to his sister in England, pity he didn't send one to us! 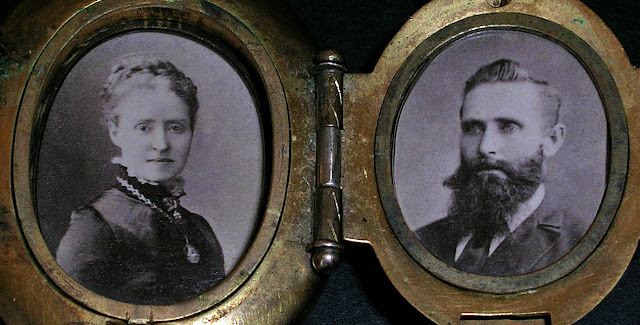 So to the two mysterious pairs of locket photos, one locket revealing two little boys (see Advancing in Australia) and in the other locket the fine couple pictured below, who are thought to be 'Mother & Father Corbin' i.e. Margaret & James. If their identities could be confirmed, these would be the only photos of them in their prime, they would be precious. But as this item has passed down the generations the certainty about its origins has faded. Comparisons with the only known images - the portrait of Margaret and the photo of James as an old man - are inconclusive. Further study and discussion of these images is definitely needed. - The Corbins' life at Valley Heights e.g. through local government and land records. - Land title for the Victoria Arcade and for 363 Glebe Point Rd. - Details of land that James lost when he went bankrupt. - The lives of Phillip Nicolle, Harry Corbin, Dr Albert Corbin and Ernest Upton Corbin. - James' mining interest at Araluen. The story of the man who brought the Corbins to Australia will always be of interest, perhaps even more so for future generations. A story has now been told, but there may be more to be discovered, we may be yet to hear the full story of James Bentley Corbin.